Nauticam proudly announces the NA-645DF Housing for the PhaseOne & Mamiya 645DF cameras with Phase One P+ Digital Backs. This camera and housing package redefines professional underwater imaging, setting new standards for the highest resolution, fastest flash sync speed, and greatest dynamic range available in any underwater camera system. Phase One P 65+ is the worlds first full frame 645 back, featuring 60.5 mega pixel and 12.5 f-stops dynamic range. Fifteen mega pixel capture is available for faster workflow and higher ISO sensitivity (up to ISO 3200), and 60.5 mega pixel offer an astounding level of detail. The P 40+ digital back offers up to 1.8fps in 10mp Sensor+ mode, and 1.2fps at 40 mega pixel full resolution. The NA-645DF housing is also compatible with P45+, P30+, and P25+ digital backs. The Phase One 645DF is an open platform medium format SLR camera body with professional grade build quality. 645DF has excellent ergonomics, with key camera controls easily accessed from the right grip, and easy menu access via the four keys on the digital back. All Phase One Digital focal plane, Schneider Kreutznach leaf shutter, Mamiya AFD lenses can be used. The mirror and viewfinder of the Phase One 645DF are approximately three times the size of a 35mm full frame system, offering greater control of focus and framing. Leaf shutter lenses and a P65+ or P40+ digital back offer flash sync speeds up to 1/1600. The Nauticam NA-645DF Housing is designed with the photographers in water experience in mind. Careful design attention results in intuitive, convenient access to key controls (shutter release, f-stop, shutter speed, AE-L, and four digital back push buttons) from the housing handles. The housing back is oversized to yield near neutral buoyancy and excellent front-back balance. Configured for the Phase One 28mm wide angle lens with a 9 inch glass dome port, the housing is perfectly balanced, and .7kg negatively buoyant. When set up with a flat port system and Phase One 120mm macro, the entire system is .15kg negatively buoyant. The acclaimed Nauticam Patented Locking Port Release Lever is incorporated into the NA-645DF housing. Lens ports are inserted straight into the Nauticam mount, eliminating the twisting or threading actions that can extrude dry o-rings. Once seated, the large red port lock lever is engaged, securely locking the port in place. To remove a lens port, the silver unlock button is pressed, the port lever rotated to the outer position, and the port is pulled straight out of the housing. Fast. Simple. Secure. Only the finest materials and cutting edge manufacturing processes are used to make Nauticam housings. The housing body is machined from solid aircraft grade aluminum, then hard anodized making it impervious to salt water. Marine grade stainless steel is used in all fasteners. Nauticam flat ports are optically coated glass. Both AR coated glass and optical grade acrylic flat ports are available. A scratch resistant coating protects even the acrylic lcd windows. Nauticam uses a sophisticated overmold process to produce extremely comfortable rubberized ergonomic hand grips. The soft feel and ergonomic design make the housing easy to grip and minimize hand fatigue on long dives. Both single and double handle configurations are available for complete customization, and each handle can be adjusted laterally allowing the user to dial in perfect fit. 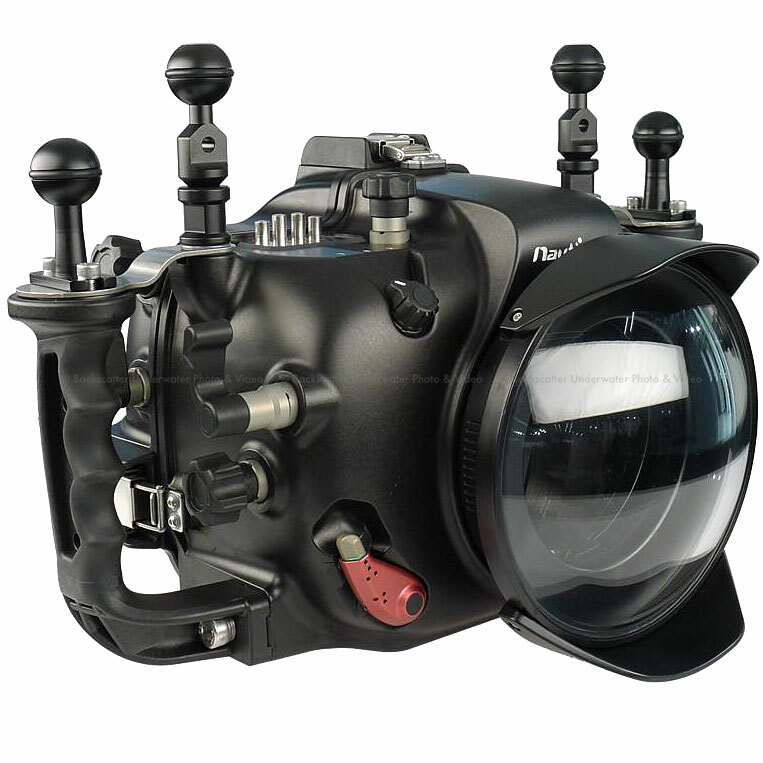 Nauticams optional accessory viewfinder provides a crystal clear life size view of the cameras optical viewfinder through a diving mask. The patented external dioptric adjustment allows eye relief to be fine tuned in water. High quality optics eliminate distortion and keep color fringing to an absolute minimum. The edge to edge, magnified viewfinder image makes confirming fine focus and checking corner composition an absolute breeze.